The climb up the glacier sculpted canyon hadn’t been too bad. How could it be on a day like this? Winds were light, and the temperature was refreshingly cool – perfect for running in shorts and a lightweight long-sleeve top. As I had worked up the Rock Creek trail, marmots, fat for the Winter, had whistled warnings of my approach and then waddled for cover. Amicable clouds embellished the high mountain sky, and sun-chased shadows quietly set the pace. New Army Pass (12,300′) is at about mile 12 of the approximately 21 mile loop. On May 1 California Cooperative Snow Surveys reported the Southern Section Sierra snowpack at 177% of normal. Four months and a very hot summer later, remnants of that snow could still be seen on the Sierra crest near the pass. My route had started at Horseshoe Meadow, climbed to Cottonwood Pass, and then followed the Pacific Crest Trail and a connecting trail to the Rock Creek trail. From New Army Pass the route would drop down to Long Lake, and then head east to Cottonwood Creek, where it would follow a roundabout route back to the trailhead. Nearly the entire loop is at or above 10,000′, and almost 12 miles of it are above 11,000′. Many miles of the route are in stands of hardy and picturesque Southern Foxtail Pine. A close relative of the Bristlecone Pine, Foxtail Pines can live to be more than 3000 years old. In places along the crest, impervious trunks of long dead Foxtail Pines lay in the talus. Many of these ancient trees are larger than the live Foxtail Pines surrounding them. In some cases the relic trees are found above the current treeline – a stark reminder of the changeable nature of Earth’s climate. The title photograph was taken on the Rock Creek Trail at an elevation of about 11,200′ looking west. Mt. Anna Mills is the sunlit peak on the left, and Mt. Guyot is the peak on the right. In the distance are peaks of the Great Western Divide. An USGS aerial photograph of the area suggests that the mound of rocks to the right of the trail may be a moraine associated with a small rock glacier. The red arrow in the aerial photo indicates the approximate position and direction of the photo on the trail. It could be the feature originated as a landslide, but semi-concentric surface ridges in the debris appear to be evidence of fluid motion at some point in the past. Here’s a Google Earth image and Google Earth KMZ file of a GPS trace of the loop. Note: There is much information available on the Internet regarding altitude sickness and acclimatization. As a starting point see International Society for Mountain Medicine: An Altitude Tutorial and Wikipedia: Altitude sickness. My plan had been to run out the Mishe Mokwa Trail to the Backbone Trail, and then head west towards Sycamore Canyon. I needed to be back in the Valley before noon, so about an hour out I would head back. Running past Echo Cliffs, I tried to pick out some of the steep climbing routes, and contemplated delicately perched Balance Rock. Sections of the trail facing into the morning sun are already warm, but shaded areas are cool and pleasant. Unlike the hot weather at the end of July, it isn’t like running in Death Valley. The last couple of times I had been on the Mishe Mokwa trail, I’d been on long point to point runs, and couldn’t be impulsive. Not so this time – so I hung a right and went to check out the rock. Here is a closer view. The rocks of this area owe their striking appearance to a dramatic geologic history. The Dibblee geology map indicates that Boney Mountain, Echo Cliffs, and the summit of Sandstone Peak are exposures of 16.1 to 13.1 million year old Conejo Volcanics, probably deposited as volcanic talus and debris-flows. After taking a few photos, I returned to the Mishe Mokwa Trail, and jogged up to the Backbone Trail. Out of time, I had no choice but to turn east on the Backbone Trail and return to the car. On the way back I did take a few extra minutes to run up the short spur trail to the summit of 3111 ft. Sandstone Peak, the highest point in the Santa Monica Mountains. 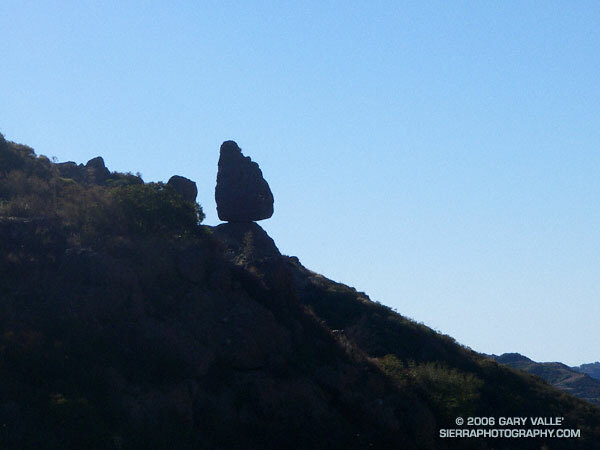 The Mishe Mokwa – Sandstone Peak loop has much to recommend it. In terms of scenic value per mile, the approximately 6 mile loop is hard to beat. 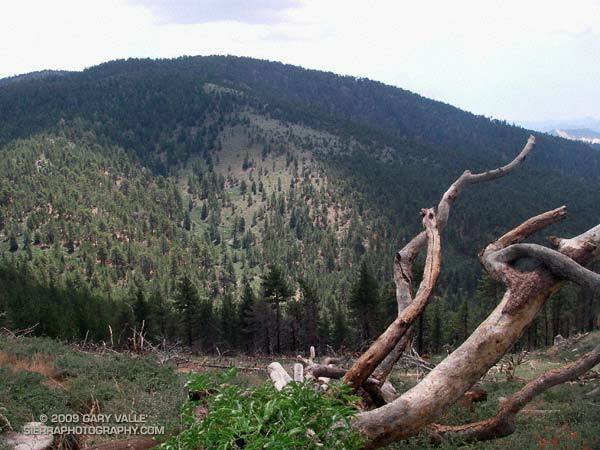 This National Park Service PDF provides additional information and a trail map of the Circle X Ranch area. Note: The mileage figure does not include the side trip to Balance Rock. The use trail to the rock – at least the one I followed – was brushy in a few spots. 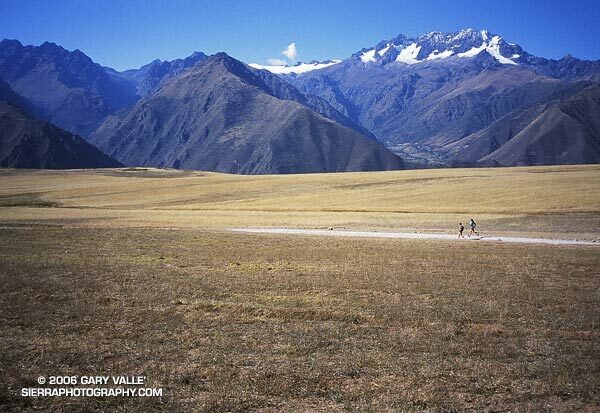 We did this acclimatization run early in our running adventure in Peru. The grain field is on a plateau at about 11,000′, and parallels the Sacred Valley of the Incas, and Urubamba River. The run took us across the plateau, down to the Maras salt mines, and then down into the Sacred Valley at a little over 9000′. Excited about the trip, we ran most of the way back to the hotel in Yucay. That evening we enjoyed Pisco Sours and an excellent dinner, and then drifted off to sleep dreaming of big mountains and expansive views. The high peaks beyond the valley are part of the Cordilla Urubamba and are over 5000m (16,400′). The highest point on the Inca Trail, the “pass of the dead woman,” is at about 13,800′. Later in the trip we would cross two 5000m passes while running a circuit of Mt. Ausangate. The photograph is from July 15, 2003. The trip organizer, Devy Reinstein of Andes Adventures, is a accomplished runner, and a genius at travel logistics and organization. What a difference a week makes! At about 10:00 in the morning, when this photograph was taken, the temperature at a nearby weather station was a pleasant 78°F. Just a week before, the mid-morning temperature had been a blazing 104°F, and neighboring Woodland Hills had just set an all-time record high of 119°F! 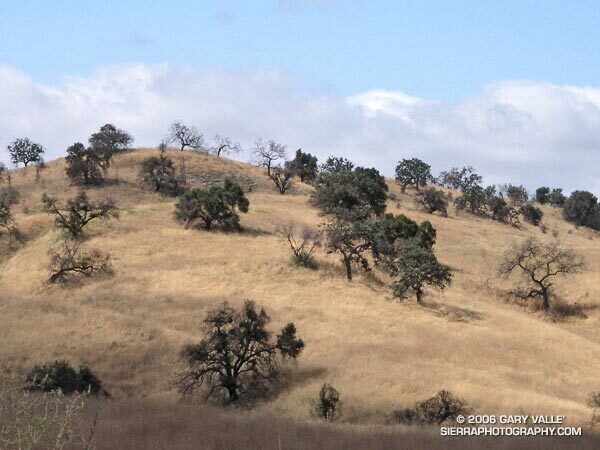 The photograph is of valley oak savanna on the north slopes of Laskey Mesa in Upper Las Virgenes Canyon Open Space Preserve (formerly Ahmanson Ranch). As mentioned in the posting Laskey Mesa Oak, this area was burned in the 2005 Topanga Fire. If you look closely, the condition of the trees varies widely. Some have full crowns; some partial crowns; and some are nearly bare. Headed back on the Ahmanson “main drag,” I had done a keyhole loop through Cheeseboro Canyon, starting at the Victory trailhead. The 13 mile route is slightly shorter than the Bulldog Loop, and has less than half the elevation gain. Following several strenuous weeks, the idea was do some tempo and not too much climbing. Here’s a Google Earth image and Google Earth KMZ file of a GPS trace of the loop, and links to trail maps for Upper Las Virgenes Open Space Preserve and Cheeseboro/Palo Comado Canyons. Saturday, Pierce College in Woodland Hills set an all-time record high temperature of 119°F. Following a preliminary review, a NWS forecaster said this was probably the highest temperature ever recorded at an official weather station in Los Angeles County. To escape this oppressive heat, and avoid the scorching temperatures of last week’s long run, my intent was to get to the highest elevation possible, as early as possible, and stay as cool as possible. At an elevation of about 8400′, the Mt. Pinos Chula Vista trailhead is nearly 2000′ higher than Islip Saddle in the San Gabriel Mountains, and is usually a good choice for a run on a warm day. A little after 7:30 a.m., under nearly cloudless skies, I jogged out of the Mt. Pinos parking lot reveling in the cool mountain air. I didn’t have a specific route in mind, but thought I would probably do a longer variation of the Mt. Pinos to Mt. Abel run described in my Vincent Tumamait Trail post. Energized by the cool temperature, it didn’t take long to work up and over the summits of Mt. 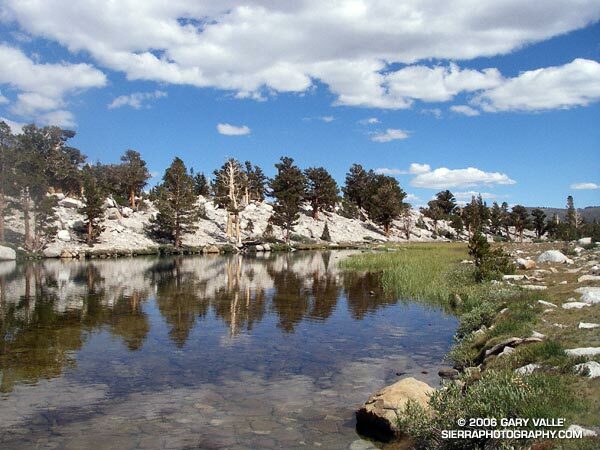 Pinos (8831′) and Sawmill Mountain (8816′), and then down the North Fork Trail to the spring at Sheep Camp (8200′). Surrounded by the greens of the spring, and the yellows and reds of wildflowers, I gulped cold water, and thought about where to run. A sign at the “T” with the Tumamait Trail listed the distance to “Lily Meadows Camp” as 3 miles. I hadn’t been on that section of North Fork trail since preparing to run the Inca Trail in 2003. Deciding to continue down to Lily Meadows Camp, I crossed over the spring and followed the little used, pine needle covered trail southeast along the hillside. 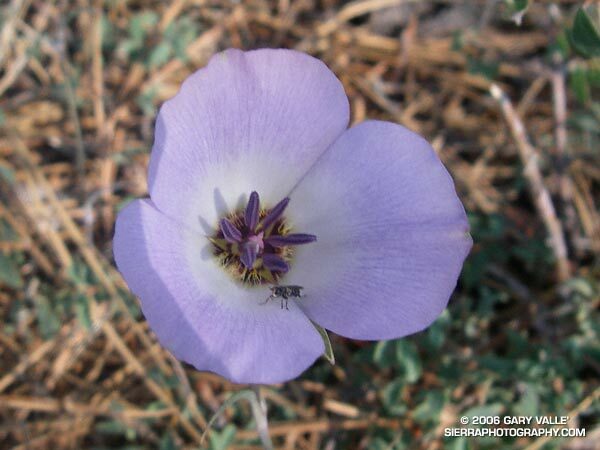 The trail dropped steeply along a rounded ridge, where mountain quail fretted among the manzanita and fallen trees, and the minty fragrance of Pennyroyal drifted up from the margins of the trail. Quicly losing elevation, I reminded myself that whatever I ran down, I would have to go back up. After about a mile and a half, the path switchbacked down to the North Fork of Lockwood Creek. 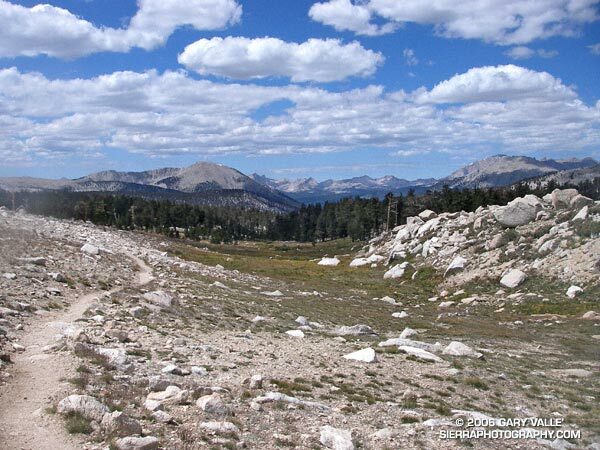 Here, the grade lessened and long stretches of nearly perfect trail running led to Lily Meadows Camp (6250′). Old growth Jeffry pines towered above the camp, and a Monarch butterfly flittered about on a current of air. The pleasant, Sierra-like environment was a welcome change from the 100 degree heat of the previous week! An 1800′ climb and an hour later, I’m back at Sheep Camp, refilling my Camelbak®. Suddenly a shadow sweeps over the forest, and a small cloud – the first cloud – looms overhead. It’s just after 11:00 a.m., and the heat of the day has triggered some cloud development. After taking a few photos and eating a Clif® Bar, I decide I better get going, and jog up to the junction with the Tumamait Trail. Reaching the trail junction at about 11:30 a.m., what had been a single tattered cloud in the sky is now several, and my “inner voice” of experience says, “Turn right, you can be back to the car in under an hour!” But it has been such an enjoyable day, and there aren’t that many clouds… I turn left towards Mt. Abel. At first, shadow and sun play tag among the trees and I join in, chasing the clouds down the twisting and turning trail. The partly cloudy skies are postcard perfect, and I wonder if my concerns are ill-founded. But as the superb downhill segment transitions to up, a gray gloom invades the forest. At Mt. Abel Road, it’s noon. Rationalizing that the extra minutes required to scramble up to Mt. Abel’s summit won’t hurt, I cross the road and head up the steep slope. Seven minutes later, I’m back at Mt. Abel road. For a brief moment, a narrow shaft of sun breaks through the darkening sky, illuminating the face of Grouse Mountain. It washes across the slopes of the mountain, and then suddenly all is in shadow. At that instant, I know I’m in a race that I cannot win. A quarter mile down the trail, the first cold drops of rain dampen my bare legs, and in another quarter mile, there is a rumble of thunder to the north, and then another rumble behind me. Part way up Grouse Mountain, there is a flash, and then directly above me an immediate ear-splitting, crackling clap of thunder. From the first few clouds to the first lightning has taken little more than an hour! In an astonishingly short period of time, the rain, lightning and thunder grow in magnitude. Flash – boom! Flash – boom! The storm engulfs me as it grows in intensity. In the expanded microseconds that follow each lightning flash, I breathe a sigh of relief that I’m not struck, and then bodily recoil from the immediate and overwhelming power of the crashing thunder. Cresting the shoulder of Grouse Mountain, I think back to a storm in the San Gabriels, where instead of striking an obvious ridge, a bolt of lightning struck a nondescript tree on the slopes below. There is no place to hide from this monster. I adopt a tactic of almost sprinting through open areas, past tall trees, and when the electric motor smell of ozone fills the air. In areas that seem a little safer, I slow my pace. At the top of another long climb, near the North Fork trail junction, I’m surprised to see a group of 8 or 9 hikers huddled under a pine tree. They are probably surprised to see someone running along the hilltops. From the first rumble of thunder, I’ve been considering whether hunkering down in the forest off the ridge might be a better strategy. If I had my shell pants, or my runner’s emergency bivi sack (a plastic trash bag), it might be. But wearing just my rain shell, a short-sleeve synthetic top and running shorts, I’m under-dressed for this get together. Off to the east, in the direction of Mt. Pinos, the sky seems lighter. Maybe the wind is shifting the cells to the west and north. I have no idea how long this thing is going to last, and the pounding rain and gusty winds are sleety cold. I don’t want to stop. Not at all sure it is the better choice, I wish the hikers the best, and continue up the trail toward Sawmill Mountain. The storm, and my emotions, wax and wane in a recognizable, but hard to define pattern. Periods of awe, elation and fear cycle with the storm. It has only been 30 minutes since the rain and thunder began, but in my distorted world, it might have been 30 hours. The steady rain has flooded the trail, and I feel like I am crossing a never ending creek. 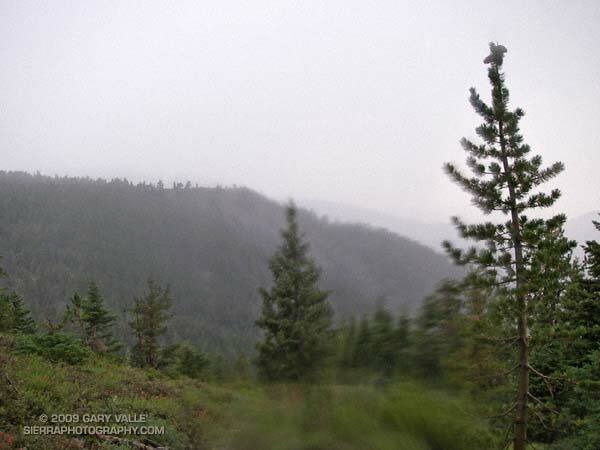 As I near the summit plateau of Sawmill Mountain, erratic gusts of wind tear at the trees. Then suddenly, as if a dam has broken, a deluge of lightning, thunder, rain and hail spills from the sky. It is the most intense rain I have ever experienced. A pounding rain, thick with hail, driven by a downburst of wind and gravity. 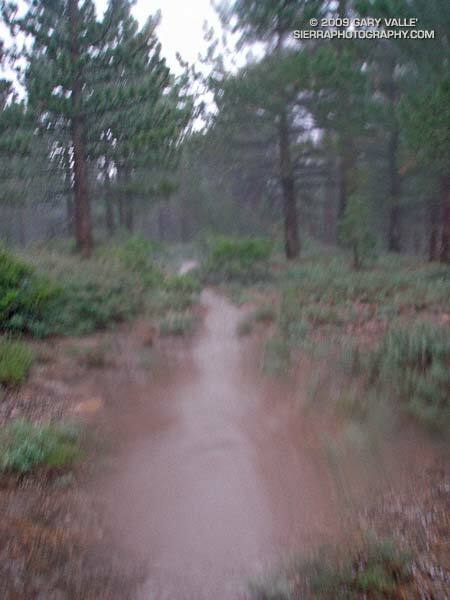 Torrents of water cascade down the trail. It is ferocious. Running through the maelstrom across the plateau, ahead I can see the point where the trail drops off the summit, and descends to a saddle. I just have to get there. Lightning flashes, and thunder booms behind me. My feet are numbed and cold, and I wonder how water on the trail can be calf deep. Reaching the shoulder of the mountain, I start to descend. From time to time I get a glimpse of Mt. Pinos, and I can see a little smudge of blue under the dark clouds over the summit. As I descend toward the saddle, the intensity of the storm seems to be diminishing. There is still lightning, thunder and rain, but for a moment the focus of the storm seems to be shifting elsewhere. I take a deep breath, and debate what I’m going to do about getting over the exposed summit of Mt. Pinos. There are still two groups of active cells. The main thunderstorm complex seems to be behind me, toward Mt. Abel; but there is also an active group of cells just north of Mt. Pinos. While I’ve seen no lightning strike the summit of Mt. Pinos, it is almost a certainty. I decide to work up the switchbacks toward the summit, continuing my tactic of minimizing my time in areas that are exposed. The rain has nearly stopped, and I haven’t smelled ozone since on Sawmill Mountain, but some sections of the trail are frighteningly exposed. Working up to the highest point that appears to offer some protection, I pause and listen. The timing may be right. The thunderstorm activity seems to be in a down cycle. I leave my alcove. In seconds I’ve rounded a rocky rib of the peak, and am suddenly the tallest and most linear object on its bare shoulder. Thunder rumbles off to the north, a reminder I don’t need. Heart pounding, I’ve already pushed the pace as much as the grade, elevation, and my body will allow, and now there is nothing for me to do but run. It is not a relief to reach the summit. I see a bolt of lightning strike to the northeast, near a radio tower less than a quarter mile away. Partially hidden from view, I can’t tell if the lightning struck the tower, or a ridge beyond. It doesn’t matter. I have to get off the summit. Running along the road from the observation point, I’m nervous about going in the direction of the relay tower, and the last lightning strike. I know the road will soon turn downhill, but as hard as I am running, I don’t seem to be getting anywhere. Finally, I see, and then round the turn. Another 50 yards, and for the moment I’m safe. A dash across one meadow, and then another, and the main danger is past. To the east, I see more blue sky, and broken clouds. Continuing to descend, I hear a group of Chickadees chattering in a nearby tree. They sound happy. So am I.
Epilogue: According to the American Meteorological Society, lightning kills more people per year on average than hurricanes and tornadoes combined. For more information regarding lightning safety, please see the National Weather Service Lightning Safety page. Here’s what the thunderstorm looked like on radar. As I turned into the Vincent Gap parking lot and pulled to a stop, a few sprinkles of rain dotted my windshield. Opening the car door, I wanted to close it again. It was 7:30 in the morning and the temperature was already nearing 70 degrees. It shouldn’t have been a surprise. 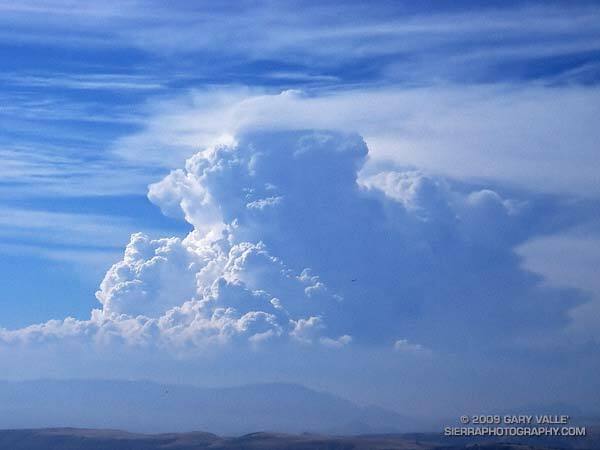 The previous two days the National Weather Service office had issued an “excessive heat warning” for much of the Los Angeles area, including the lower elevations of the mountains. Angeles Crest Highway was closed 2.6 miles west of Islip Saddle, so my plan was to do the Islip Saddle – South Fork – Mt. Baden-Powell loop from the Vincent Gap side. (Update May 21, 2009. Angeles Crest Highway has since been re-opened to Islip Saddle, and through to Wrightwood.) This difficult 23 mile loop, and some of its logistical issues, were described in the posting Complications. The day was really too warm to be doing this route, but with a chance of thunderstorms in the forecast maybe some clouds would help keep temps in check. I’d run at least to Little Jimmy Spring. If it was too hot, I could always head back. It didn’t take long for the clouds that had spritzed my windshield to move off to the west. Except for a smoky haze from the Sawtooth Fire, mostly clear skies prevailed as I worked up the numerous switchbacks of Mt. Baden-Powell. Near the summit of of the peak, I paused for a moment to admire the Wally Waldron Tree. 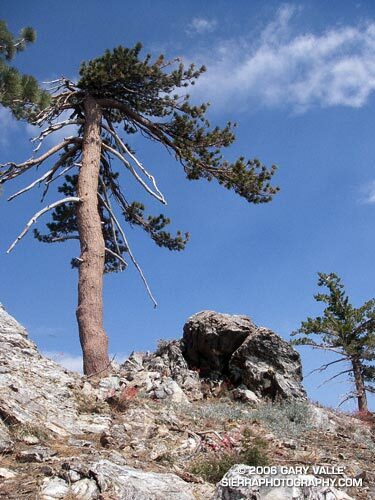 At an elevation and in an environment similar to the 4000+ yr. old White Mountain Bristlecone Pines, this gnarled and weather-beaten Limber Pine is estimated to be 1500 years old. Clearly ancient, it has survived wind and weather too extreme to imagine. 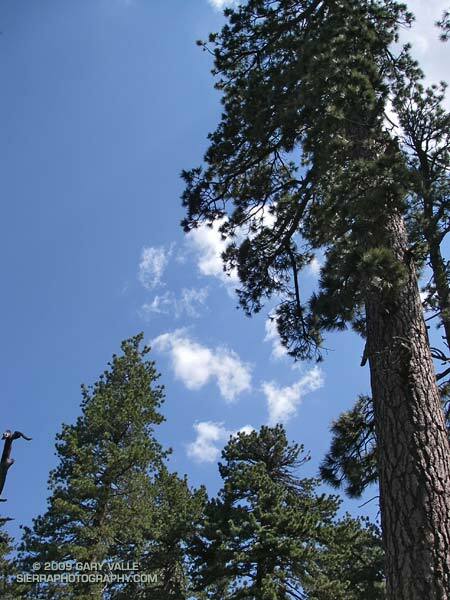 According to the Forest Service, some Limber Pines in this area may be as much as 2000 years old. Extended longevity doesn’t appear to be limited to Limber and Lodgepole pines; a stunted White Fir near the summit also looks unusually old. Down from the summit, and back on the Pacific Crest Trail, the running along the ridge was outstanding. Near Mt. Burnham, I stopped to take a few photographs, and watch a bumblebee working through a batch of Grinnell’s Penstemon (Penstemon grinnellii). The throat of this particularly bulbous penstemon perfectly accommodates the bumblebee, and perhaps is an example of a flower adapting to a preferred pollinator. Continuing along the crest, between Throop Peak and Mt. 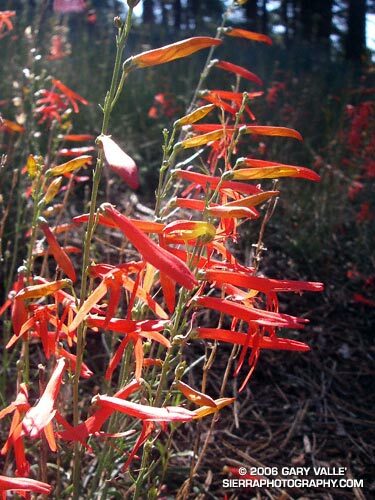 Hawkins, red accents among the rocks marked patches of Bridge’s Penstemon (Penstemon rostriflorus). From time to time, sparse clouds masked the sun, but as I descended toward Windy Gap, the temperature climbed inevitably higher. One of the pros of doing the loop from Vincent Gap is that it is great to have fresh legs for the exceptional trail running down to Islip Saddle. 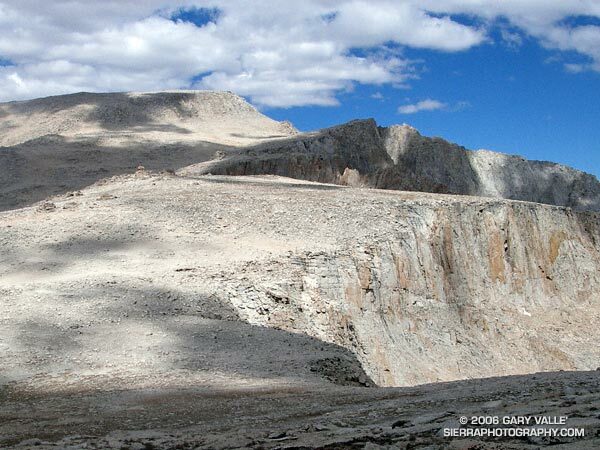 Except for a short climb over the shoulder of Throop Peak, the running is generally downhill from the summit of Baden-Powell (9399′), all the way to South Fork Campground (4560′). This is a distance of over 13 miles, with an elevation loss of nearly 5000′. The major con is having to do the lowest elevation segment of the loop, and the climb back to Vincent Gap (6565′), during a warmer time of the day. Aside from the heat, another concern had been nagging at me. What if the trail was impassable? This wasn’t heat induced paranoia. Last year, several sections of the South Fork trail were buried in small rock slides, and a couple of places where the Manzanita Trail crossed steep erosion gullies were in very bad shape. A Winter had passed, and who knew what recent thunderstorms had done to the trails? Epilogue: In sun-baked South Fork canyon, even the downhill was difficult, but the rock slide plagued trail was still passable. Some clouds provided temporary relief at South Fork Campground, but didn’t last. The damage to the Manzanita Trail was worse than last year, but with care I was able to get through. In nearby Valyermo, midday temps reached over 100°F. Here’s a Google Earth image and Google Earth KMZ file of a GPS trace of the route, and a Forest Service diagram of area trails that’s at Vincent Gap.